With the 2019 Kentucky Oaks series of prep races completed Friday, the picture of which 14 horses will enter the gate on May 3 at Churchill Downs is coming into focus. A full field has contended in every running of the Oaks since 2015, and it's likely there will be more movement before the entry deadline. 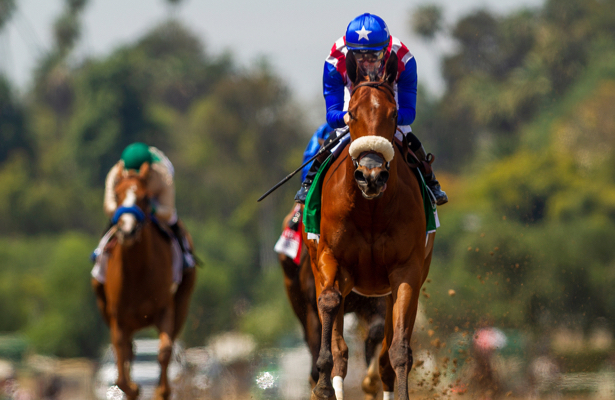 For now, we've listed the prospective contenders, and note that earnings listed are for prize money accumulated from non-restricted graded stakes races. Those earnings are the tiebreaker should horses tally an equal number of points. Fillies are listed in points order with their owner, trainer and earnings. 1. Bellafina, 132 (Kaleem Shah – Simon Callaghan – $1,060,000): This daughter of Quality Road has dominated the West Coast preps, most recently winning the Santa Anita Oaks (G1). But she did run her worst career race at Churchill Downs when fourth in the Breeders' Cup Juvenile Fillies. 2. Champagne Anyone, 113 (Six Column Stables and Randall Bloch – Ian Wilkes –$197,150): Having made her last three starts at Gulfstream Park, Champagne Anyone punched her ticket into the field with a convincing win in the Gulfstream Park Oaks (G2), holding off a late-charging Dunbar Road in the final strides. 3. Street Band, 105 (Larry Jones, Cindy Jones and Ray Francis – Larry Jones – $248,000): This Fair Grounds local came out of the shadows after an allowance win in January, winning the Fair Ground Oaks (G2) just two months later when the heavy favorite Serengeti Empress faded from the lead due to a bleeding episode. 4. Lady Apple, 100 (Phoenix Thoroughbreds and KatieRich Stable – Steve Asmussen – $336,000): A perfect 3-for-3 in 2019, the daughter of Curlin climbed from maiden to allowance win and then rushed up the rail to win Oaklawn Park's Fantasy Stakes (G3), the final Oaks points prep. 5. Out for a Spin, 100 (Commonwealth Stable – Dallas Stewart – $300,000): The daughter of Hard Spun shocked in Keeneland's Ashland (G1) with a 52-1 upset, the type of performance for which her trainer is known. Out for a Spin entered off an allowance victory at Fair Grounds. 6. Liora, 71 (Coffepot Stables – Wayne Catalano – $246,280): She hasn’t won yet as a 3-year-old, playing second fiddle in Fair Grounds' preps, but proved capable of big things when defeating Restless Rider last November in Churchill Downs' Golden Rod (G2). 7. Restless Rider, 62 (Kenny McPeek – $849,560): She takes a unique route into the Oaks having waited until the first weekend of April, by design, for her 3-year-old debut. The Grade 1 winner ran a credible second in the Ashland and has contended with the best in this class. 8. Serengeti Empress, 60 (Joel Politi – Tom Amoss – $313,270): An inconsistent sort, this filly can't be blamed for what happened last time when she looked like a Fair Grounds Oaks winner before bleeding through Lasix. Whether she goes in the Kentucky Oaks is still a question, though Amoss has her back in training at Churchill. 9. Motion Emotion, 60 (Mark DeDomenico – Tom Van Berg – $140,000): This daughter of Take Charge Indy finished second in the Fantasy Stakes, following up on another runner-up in Oaklawn's Honeybee (G3). She'll add some certain early pace to the Oaks. 10. Jaywalk, 55 (Cash is King and Leonard Green – John Servis – $1,409,800): The Cross Traffic filly hasn't run back to her 2-year-old championship form in a pair of starts to open 2019, finishing third in the Davona Dale (G2) and fourth in the Ashland after going out on the early lead. Servis has said, however, that Jaywalk should move forward. 11. Chocolate Kisses, 51 (Debby Oxley – Mark Casse – $152,000): She was already qualified for the Oaks before running sixth in the Ashland. David Carroll, assistant trainer, said to draw a line through that one, as connections tried to change up her style. Chocolate Kisses won the Honeybee two back when coming from off the pace. 12. Jeltrin, 51 (ADR Racing Stable – Alexis Delgado – $128,720): On what was supposed to be Jaywalk's big day, this daughter of Tapizar, same sire as 2018 Oaks winner Monomoy Girl, upset in the Davona Dale at 51-1. It was the first graded victory for her connections, who are training her up to the Oaks from the March 2 race. 13. Positive Spirit, 50 (Michael Ryan – Rodolphe Brisset – $199,500): The easy winner of Aqueduct's Demoiselle (G2) to cap her juvenile season has run to varying results at 3. After missing the board in the Rachel Alexandra, she returned to be second in the Gazelle in New York. Brisset has said she's only possible, not probable, at this point for the Oaks. 14. Flor de La Mar, 40 (Godolphin – Bob Baffert – $80,000): Baffert has elected not to run Chasing Yesterday, the Grade 1 winner from his barn, but does have this up-and-comer who ran second by 3 1/2 lengths to Bellafina in the Santa Anita Oaks. She was late to the races but impressive on debut Jan. 20. The bubble: Cookie Dough and Dunbar Road, both with 40 points, are next on the list, and connections have indicated they'd pay the $1,500 late Oaks nomination fee to become eligible if the opportunity presents itself. Eres Tu (24), Brill (22) and Sweet Diane (22) round out the first five out. Divine Image, a Dubai-based filly who ran last in the UAE Derby (G2) against the boys, remains on the leaderboard but isn't nominated. She's not expected to make the trip.